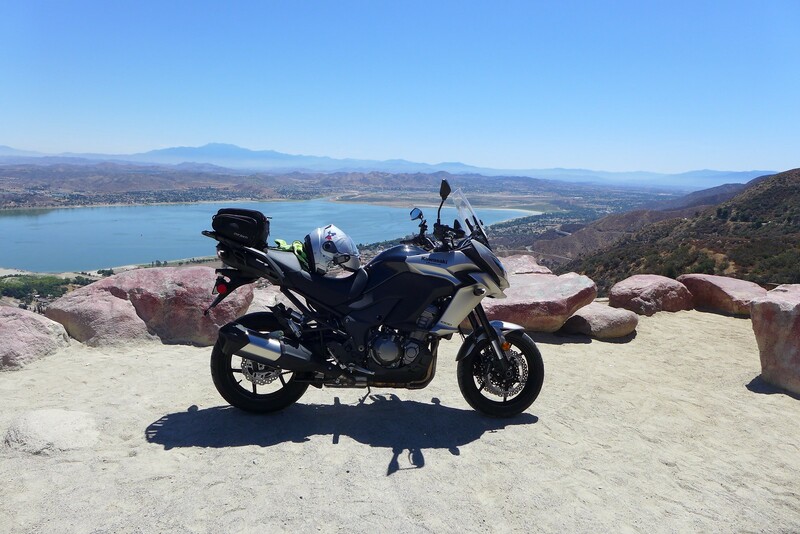 Kawasaki Versys Forum > Kawasaki Versys 650 Motorcycle Talk > General Discussions - V-650 > What did you do on your versys today? For finding parts, I take bright colored similar size thing and drop it, see where it goes. If no luck, then I get a super bright light and bike lift. Get it up and start staring. Last ditch - disassemble. Have fun. I bought a cheap less than $20 SJ4000 knock off. I Don't recommend - video quality is crap and it is temperamental, I think it just died. That said I will look to replace it with a real original SJCAM 4000 $60??. When the cheap crap I bought was working the concept was great. I used the water proof housing drilled a hole in the side to run a usb cable to power it. Put in a 32GB memory card then set up the camera to start whenever it received power from the USB and set it for 10 minute clips and looping. Looping means when the memory card is full it starts writing over the oldest video clip. I would always have about 5 hours of video on the memory card. I have had people cut me off, brake check (for no apparent reason) etc. so I think it is good to keep a video record just in case!!! Just installed my new Cortech tailbag. It will be for my day to day use, I'll save the panniers that came with my LT for the weekends. What tires are you using for tires off road? Are you using stock seat for 2up? Did a nice 200 mile ride around the N GA mountains yesterday (Mothers day). Weather was perfect and traffic was very light. Doesn't get much better than that! I've said the exact same thing to other drivers before, it used to happen to me a lot when I commuted to work. 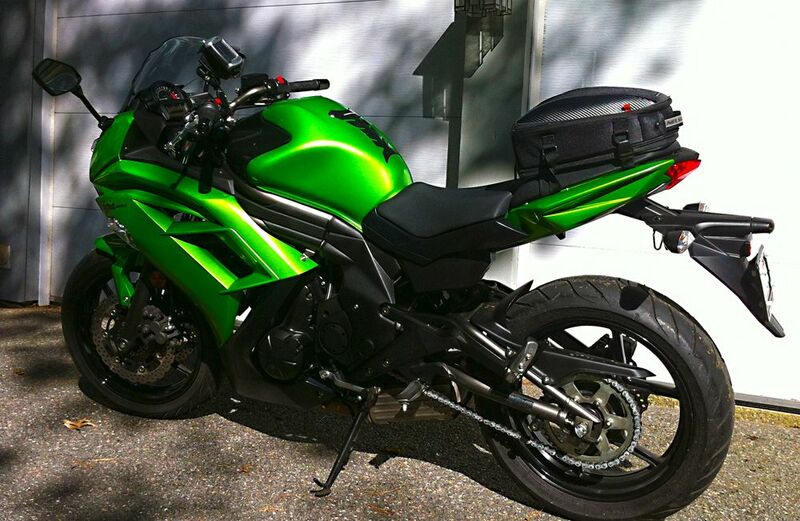 I have the original version Cortech Sport tail bag on my Versys right now. Used to be my touring luggage on my Ninja. I just ordered a new Nelson Rigg CL-1060 to replace it. I like the Cortech design but I wanted something with a lower profile and that attached under the seat and not to the frame. I plan on using my luggage mostly for touring but we'll see how that plan turns out. Out of town at the moment, but I'll try to put some pics up this weekend, with and without the panniers on the bike (since I need to practice adding/removing them some more ;^). Last edited by Steves308; 05-17-2017 at 11:08 AM. I looked up this bag, and it appears to be just as tall as mine, though a bit narrower. I'll try to post some pics of mine up this weekend, could you post some of yours? 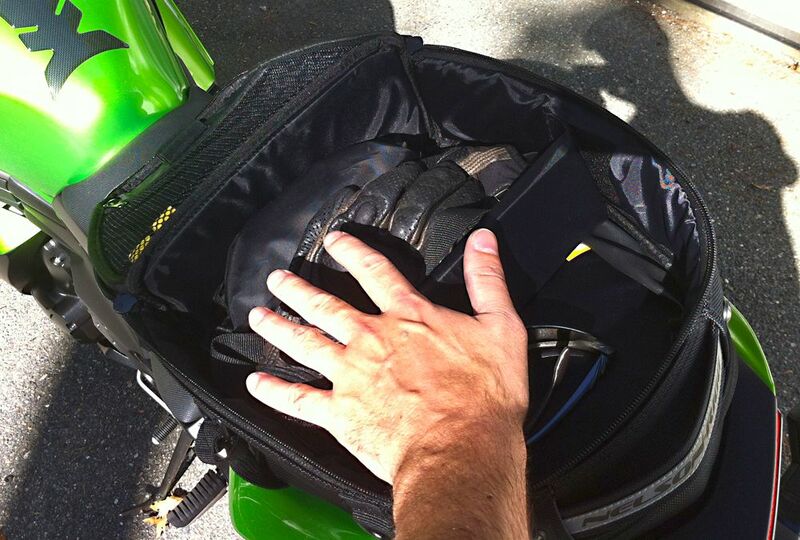 I need the width to carry my work laptop when I ride into the office, could you fit a 15 inch laptop in your bag? Here is the old Cortech, you can see it has a steep pitch and the front of the bag is quite tall. One of the neat features are the sewn in bungee cords. Really simple to hook on and off the bike, like in seconds. I believe that was removed in the 2.0 version. It could easily fit a laptop if you expand the side pouches. 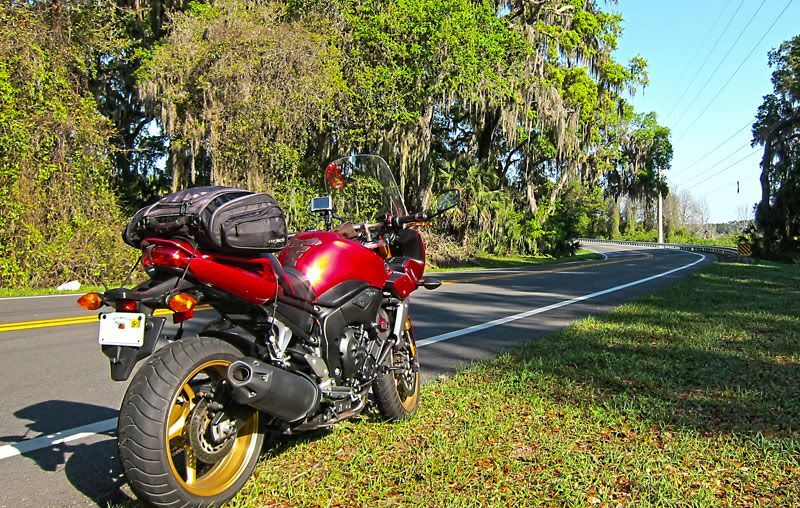 Here is a photo of the tailbag when I was down in Florida. It's expanded all the way and it alone held everything I needed on that trip for an entire week besides the clothes on my back and the boots on my feet. Oh yeah, and my helmet! This is the Nelson Rigg bag I have on order. Here's the old version on my Ninja. I really like this design, it has a very rigid construction and a low profile. Plus it ties down under the seat so it's nice and tidy without straps hanging all over the place. I'm selling this particular bag with my bike simply because this version has the expansion zipper below the tie-down straps making virtually useless. Also with this version the rain cover is sewn into the main compartment taking up a little bit of real estate and the new version is simply a loose cover. It's not huge like the Cortech but I can carry all the daily stuff I need, gloves, sunglasses, earplugs, water bottle, tire repair kit and a few other odds and ends with room to spare. It won't hold a laptop though. Installed a Denali Mini Soundbomb. It may not be any louder than stock, but sure sounds bigger. Ah, I see it is lower. That's not a bad sized bag, but I do need to carry a laptop, those things have always determined the size of my tailbags. And I do miss the bungie cords from my previous Cortech bag, though with the way this bag buckles into the straps, it's not too bad in terms of removing/connecting to the bike. But it did take a bit of effort and sitting and thinking (and drinking a beer ;^) to get everything installed the first time. Last edited by Steves308; 05-17-2017 at 03:09 PM. I bought mine in either 2009 or 10. I don't think mine has aged quite as nicely as yours. Functionally everything still works well but mine is all sun-faded. 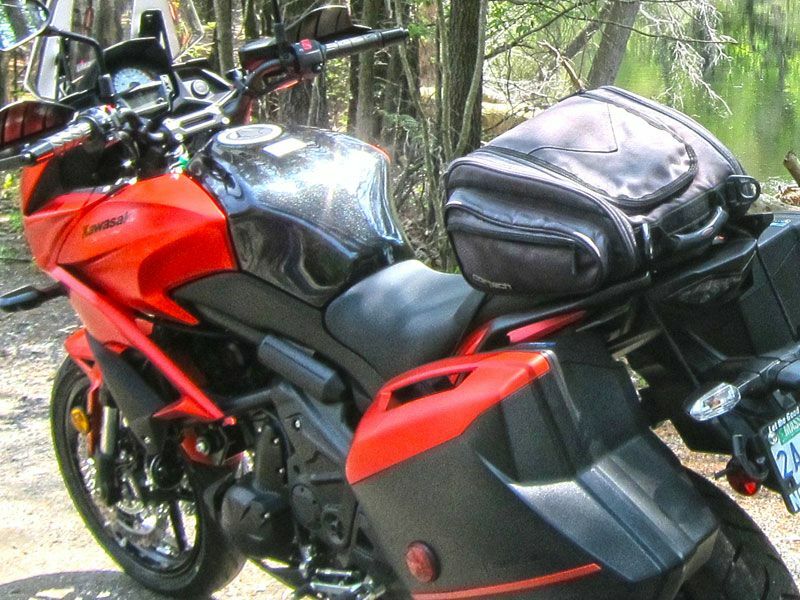 I have the matching saddlebags and when I connect them all together the tail bag looks purple and the saddle bags jet black. It's a great airport bag too if you're traveling and renting a bike, fits neatly under the seat in front of you. Installed sw-motech crash bars, usb AC adapter, and gave her a bath. Ordered a volt meter from sparkbright! Anyone installed one of these? Just added a Madstad screen. I went with the 20" medium grey. I am still trying to dial it in but so far so good.